Hydrogen is a medium for storing energy. To be useful as an energy carrier, all fuels, such as gasoline and natural gas, have a characteristic of being volatile. 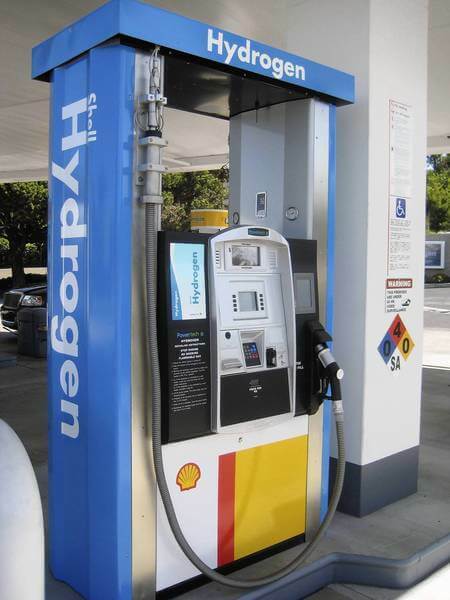 Hydrogen's benefits differ from the fossil fuels commonplace in an advanced energy utilizing society such as in the United States. Gasoline and oil are extremely toxic and poisonous to humans along with wildlife when unintentionally released into the environment. If a hydrogen spill occurred, the hydrogen would evaporate almost immediately leaving only water behind. Oil and gasoline, on the other hand, require immense clean up efforts with the result being that most of the spilled toxic gasoline or oil seeps into the surrounding ecosystem causing irreparable harm. Hydrogen, when burned in a combustion engine, is a huge improvement in terms of emissions when compared to fossil fuels. Burning hydrogen does however, release low amounts of nitrous oxide, a component of smog, into the atmosphere. This occurs whenever high temperature combustion occurs in the presence of oxygen. Other pollutants are also released as trace amounts of lubricants are burned in the process, yet fuel cells still emit ultra-low pollutants when compared to fossil fuels. The main reason to employ fuel cells instead of combusting hydrogen has to do with efficiency. Anytime a fuel is ignited and burned the overall efficiency is limited by the laws of physics, to around 10%. This is due to efficiency losses associated with heat and the additional steps necessary before the fuel is transformed into usable energy. A fuel cell directly converts the hydrogen fuel into electricity and is therefore inherently more efficient. A fuel cell skips the steps, associated with combustion generation, of first converting the fuel into heat, then mechanical energy and finally into electrical energy. In an automobile engine 100 standard cubic feet of hydrogen would power the car for about 6 to 12 miles. That same amount of hydrogen in a fuel cell powered car could increase the distance traveled from 12 to 24 miles. Hydrogen is commonly associated with two things, the Hindenburg disaster and the hydrogen bomb. The exact cause of the Hindenburg fire is still under investigation. In 1937 the Hindenburg was destroyed attempting to land in an electrical storm outside of Lakehurst, NJ. Witnesses reported observing a blue glow on the top of the ill-fated airship. A bluish glow is often indicative of extremely high electrical activity. The current school of thought is that electricity around the flimsy, aluminum flake containing casing of the hydrogen most likely ignited it. The design and size of the Hindenburg also needs to be kept in mind. A passenger car or fuel cell operating on hydrogen would never have such a large amount of hydrogen stored in a flimsy cloth bag covered with highly conductive metal. Today’s fuel cell systems and hydrogen storage techniques are engineered with safety being a paramount concern. The composite tanks used to store liquid and gaseous hydrogen are required to undergo rigorous safety testing before they are certified for hydrogen storage. Hydrogen gas has also received negative press in the past because of its relationship to the hydrogen bomb. This worry is completely irrational because hydrogen will only fuse under extremely high heat and pressures that would never be found in a fuel cell system or hydrogen storage device. Remember, the H-bomb was a thermonuclear weapon containing radioactive hydrogen isotopes forced into nuclear fusion by heat obtained from the nuclear fission of uranium. Only with the presence of a radioactive substance such as uranium undergoing fission, will the hydrogen atoms even come close to being hot enough to even potentially undergo fusion. Even then, H2 and its isotope H3, or tritium, must both be present. Tritium is extremely rare and breaks up in one millionth of a second. The hydrogen used in fuel cell energy is strictly H2. It would take about 10 Nm3 of hydrogen gas to equal the energy present in 1 gallon of gasoline or 8.3 pounds of coal. The Union of Concerned Scientists have issued a report stating that, "If the entire U.S. passenger vehicle fleet were powered by hydrogen FCVs (fuel cell vehicles), the amount of water emitted annually (assuming no losses) would be 0.005% the rate of water that is released by plants during photosynthesis, in the continental U.S."
Below are example calculations for determining the cost of operating a 1kW fuel cell on hydrogen. In these examples a compressed hydrogen cylinder with a capacity of 196 cubic feet of hydrogen at normal temperature and pressure (NTP) is used. The purity of hydrogen consumed is 99.99999%. 1. Compressed hydrogen cylinder – 200 cu.ft. of hydrogen (NTP) or 5667.37 Liters. 2. Cost of hydrogen cylinder is $100 + $14/month (rental) +$20 (delivery). 3. 1kW fuel cell system with a hydrogen consumption rate of 13 Standard Liter/min. 4. Number of hours of operation at 1kW = 5667.37/13 = 7.26 hours. The cost of operating a 1kW fuel cell for 7.26 hours when only one cylinder is purchased per month is $134. This is equivalent to $18.40 per hour to operate at one kilowatt. When the number of hydrogen cylinders used is increased, then the cost is reduced. Assuming that 5 cylinders of hydrogen are consumed in one month, this gives 7.26 x 5 = 36.33 hours of operation. The cost of the cylinders is (5 x $100) + (5 x $14) + $20 = $590. This is equivalent to $16.24 per hour to operate at one kilowatt.